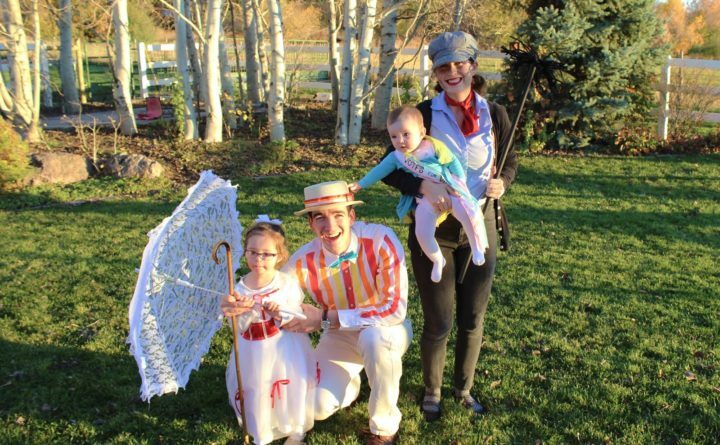 Rosie and Madeleine pose with their parents, Caleb and Melissa, in their Mary Poppins-themed outfit for Halloween. With Halloween fast approaching, the hunt is on for the ideal costumes that will transform mere mortals into favorite superheroes, movie stars, products or characters. But don’t be limited by store-bought costumes. Making Halloween costumes is a creative, crafty and economical way to have a unique costume. And here’s the thing — you don’t have to be an experienced crafter or seamstress to make homemade costumes. Just ask Darlene McSwine, 24, of Milo, Maine, who successfully made her first costume this fall. Sage McSwine, 2, of Milo, wears a homemade scarecrow-themed dress made by her mother, Darlene McSwine, for Halloween. Drawing inspiration from photos she found on the internet, McSwine created a scarecrow-themed dress for her 2-year-old daughter, Sage. 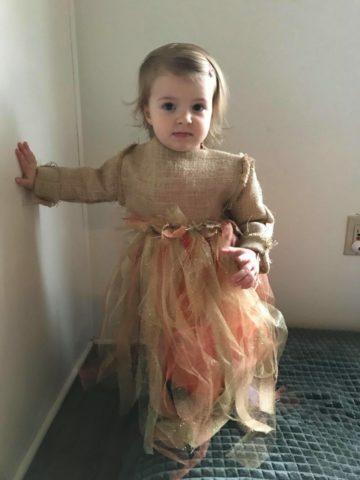 Experimenting with burlap and colorful pieces of tulle and cotton, she pieced together the outfit, adding a second layer and long sleeves to make it warm enough for Maine’s fall weather. In all, she spent about $15. A self-described “newbie” at sewing, McSwine said that creating the costume was easier than she anticipated. She didn’t have a sewing pattern, so she simply outlined one of her daughter’s dresses and improvised. While McSwine is new to the world of costume-making, some Mainers have been piecing together Halloween costumes for years. And for first-timers, they have some knowledge and stories to share. Start early and be flexible. Caleb and Melissa Swanberg of Caribou pose with their daughter, Rosie, dressed as the famous chemist Marie Curie for Halloween. To join her, Melissa and Caleb simply wore black outfits and signs of the radioactive elements that Curie discovered: radium and polonium. Last year, all four of them dressed up as characters from Mary Poppins, and while they wanted to find a white blazer for Caleb Swanberg’s costume as Jolly Holiday Bert, they couldn’t find an inexpensive one, so they settled with a white dress shirt, instead, and painted red, orange and yellow stripes on it. Sometimes being clever is more effective than being crafty. One of the simplest costumes they ever made was the famous chemist Marie Curie, who pioneered research on radioactivity. To transform their then 2-year-old daughter Rosie into the scientist, they had her wear a black dress and tiny lab coat, then placed some glow sticks in her pocket to look like vials of radioactive materials. She also wore a name tag saying, “Hello, my name is Marie Curie” and a few print-outs of Nobel medals. 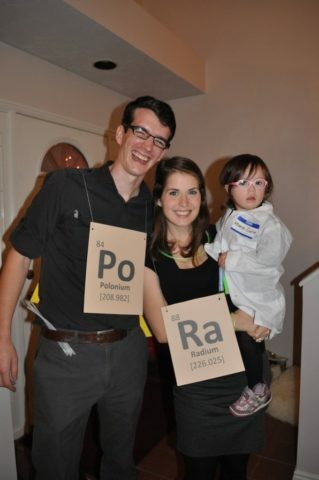 To join her while trick-or-treating, Melissa and Caleb simply wore black outfits and signs of the radioactive elements that Curie discovered: radium and polonium. Cardboard can be used to make pretty much anything. “We’ve done some really quick costumes with cardboard and duct tape,” Mindy Rowlands of Morrill said. 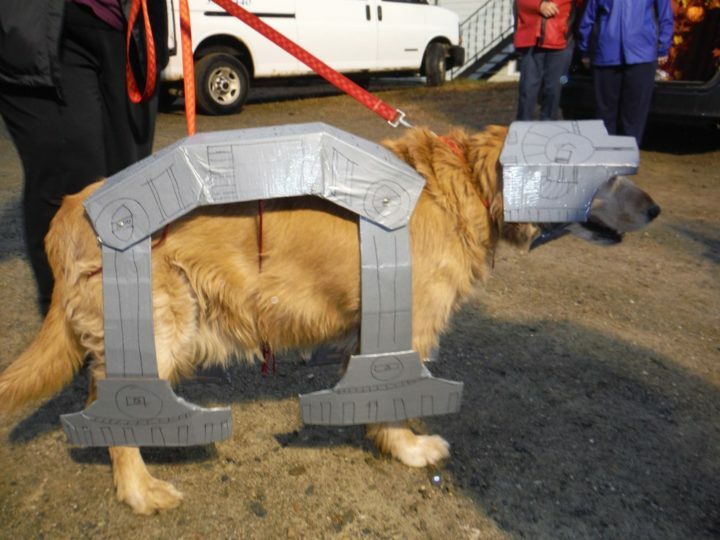 Mindy Rowlands of Morrill used cardboard, duct tape and permanent markers to transform the dog into an AT-AT Walker Star Wars vehicle for Halloween. Her children, who were Star War characters that year, wanted their dog to join them in dressing up. One year, her children dressed up like Star Wars characters for Halloween, and they wanted the family’s golden retriever, Brady, to join them in the fun. So Rowlands used cardboard, duct tape and permanent markers to transform the dog into an AT-AT Walker Star Wars vehicle. Felt can quickly transform regular clothing. Last year, Kristina Weaver of Orono quickly made her son into a cow by covering a white sweatsuit with black felt blobs. For a last-minute costume, it was perfect. Felt is an easy fabric to work with because it doesn’t unravel and holds its shape. It’s also warm, inexpensive and comes in many colors. Halloween enthusiasts Alison and Roy Murdoch of Gouldsboro have fond memories of making their children costumes each year. The holiday was always an opportunity for the whole family to express their “whimsical side.” Over the years, they’ve transformed themselves into sharks, ninja turtles, Power Rangers and more, and they always did it from scratch, on a budget. “The kids helped, and I think that really made it more fun to them, to help design what they were going to be,” Alison Murdoch said. One of Alison Murdoch’s fondest memories of Halloween is baking ghost cookies with her then 3-year-old son and dressing him up in a homemade spider costume for school. Her children are now grown, and these vivid memories have made the extra effort worth it, she said. Repurpose pieces of past costumes. If you’re on a tight budget or don’t have the time to purchase new material, resurrect a costume from years past and make a few alterations to breathe into it new life. Think outside the box when it comes to materials. A creator of elaborate Halloween costumes, Marion Sprague of Westbrook attributes her love of dressing up to her background in theater. For her, Halloween is a time to get creative — and maybe go a little over the top. This year, Sprague decided to become the snowy owl Hedwig from Harry Potter, but she had a problem. 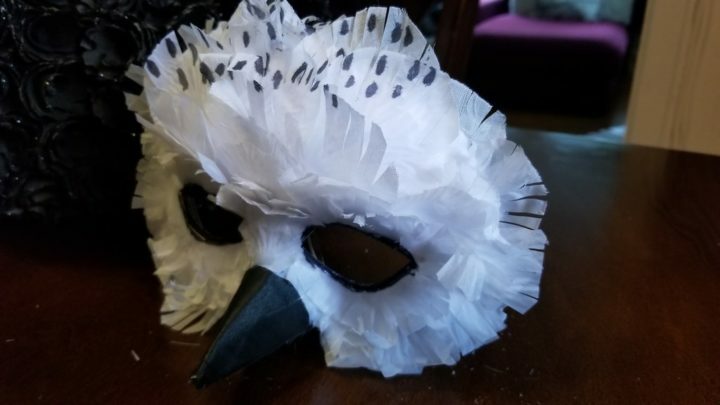 Marion Sprague of Westbrook made a snowy owl mask using silk rose petals, along with a little cardboard, tape and glue, for her 2018 Halloween costume: the owl Hedwig from Harry Potter. Sprague carefully arranged white silk petals on a mask, then cut little slits in the petals and drew black marks on them to make them appear more feather-like. The effect is stunning. Don’t get stuck surfing Pinterest. While it’s tempting to gather ideas from the internet, sometimes the best costume ideas come from other sources — or straight from your imagination. This year, Kristin Beauchamp of Dedham is making her son and daughter, ages 8 and 6, into astronauts because they both are fascinated by space. “My son is super into Mars and rovers and space exploration, and his little sister is really into stars and the planets,” she said. 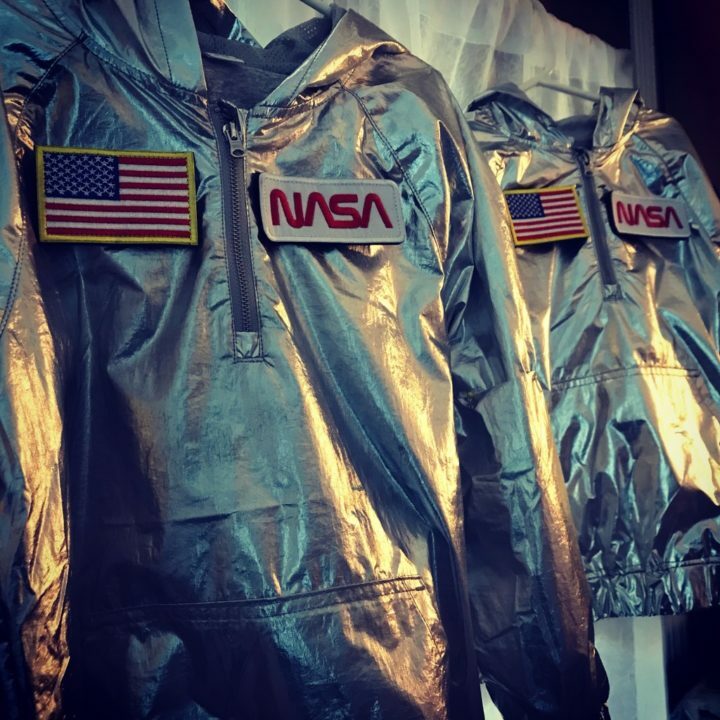 To create astronaut costumes for two of her children, Kristin Beauchamp of Dedham simply fastened NASA and United States flag badges on silver jackets she found on clearance. And she's working with her children, ages 6 and 8, to create the helmets out of paper mache. To create the astronaut uniforms, Beauchamp plans to sew NASA badges on silver jackets she found on clearance and build their helmets out of paper mache, using big round balloons as forms. She planned to keep the helmets simple, but her son has already expressed the desire to add gauges, levers and lights to it — to make it seem more authentic. Wyatt Beauchamp, 6, and his sister Ruby Beauchamp, 4, of Dedham, dressed up as jellyfish for Halloween of 2016. Their costumes were homemade and included clear umbrellas, LED lights and fabric tendrils. She’s always dressed the two in companion outfits, and so far, they haven’t complained. Last year, they were Jack and Sally from “Nightmare Before Christmas,” a look achieved with some truly spectacular facepaint. 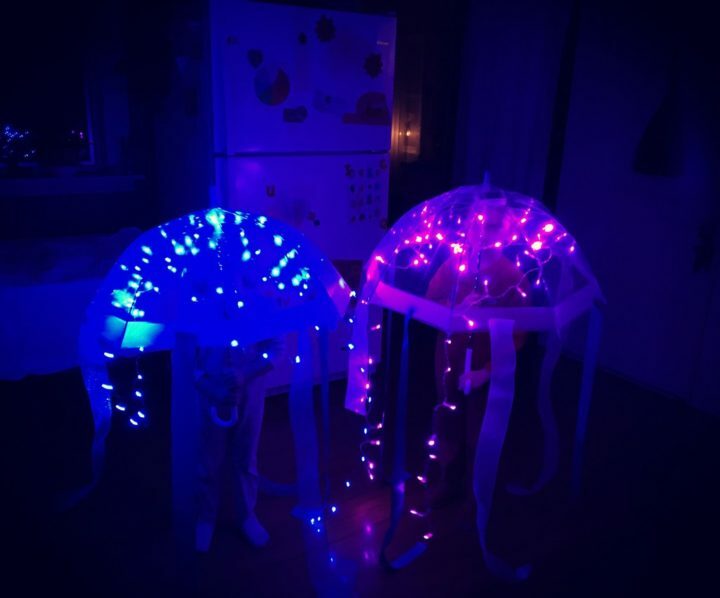 And the year before, they became jellyfish by holding clear umbrellas decorated with LED lights and fabric tendrils. 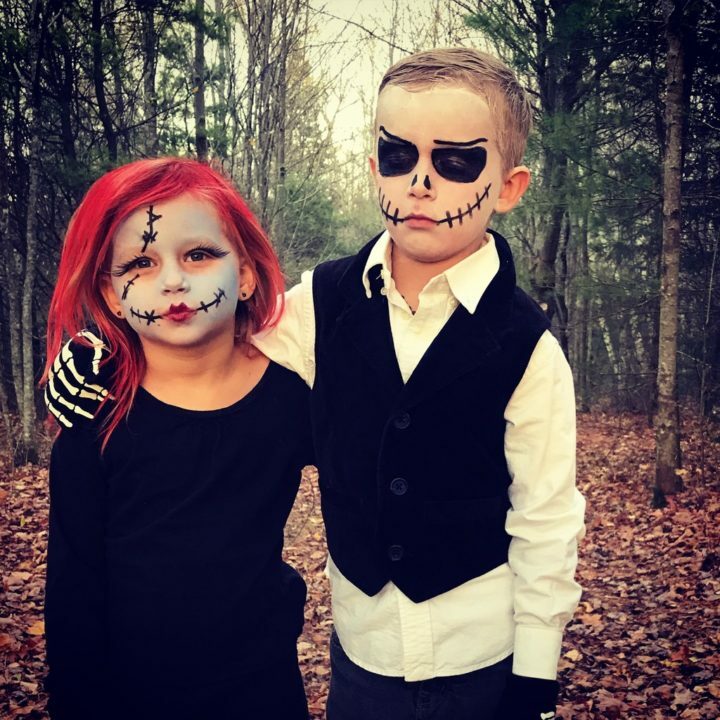 Wyatt Beauchamp, 7, and his sister Ruby Beauchamp, 5, of Dedham, dressed up as Jack and Sally from “Nightmare Before Christmas" for Halloween of 2017. Their costumes were pieced together with clothing they already owned, some thrift store pieces and some truly spectacular facepaint.